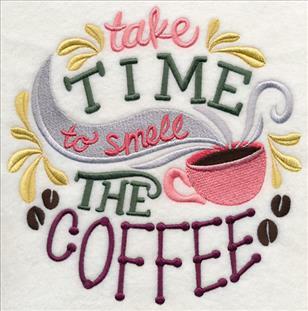 Relax with a hot cup of coffee or a freshly brewed mug of tea with this embroidered coaster. 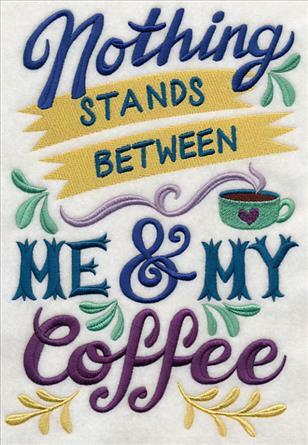 The sweet mug shape makes it perfect for your morning cup of joe, and will protect end tables, dining tables, and countertops while adding a splash of color to any decor.. 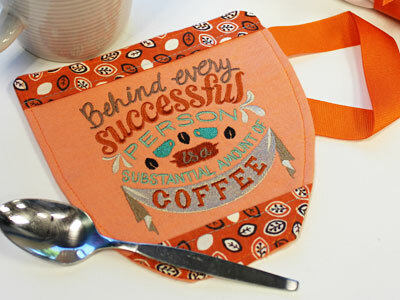 The design used in this example is J5593, Behind Every Successful Person. 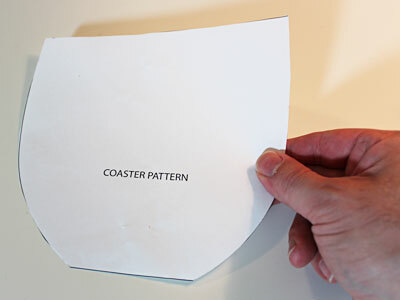 Begin by printing the PDF of the coaster pattern here. 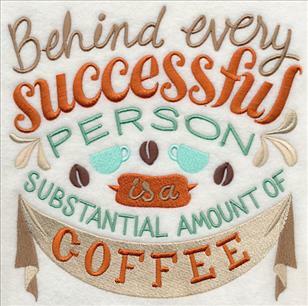 The pattern will print on one piece of 8 1/2" x 11" printer paper. Cut a piece of flannel a little larger than the hoop. 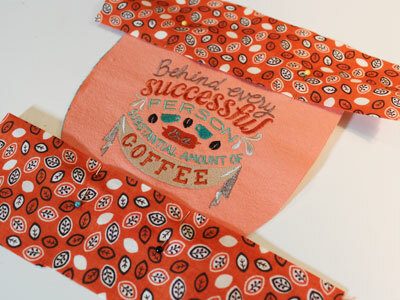 Pin the printed pattern piece to the fabric. Trace the shape with an air-erase pen. 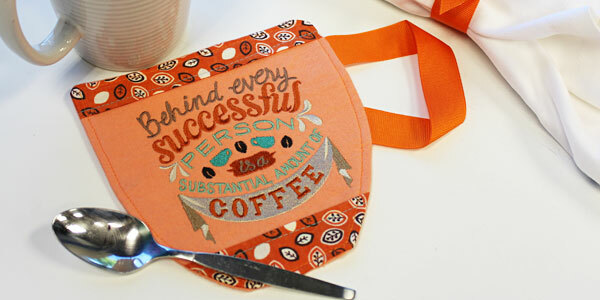 Trim around the template to make it easier to place. the top and bottom of the drawn shape. 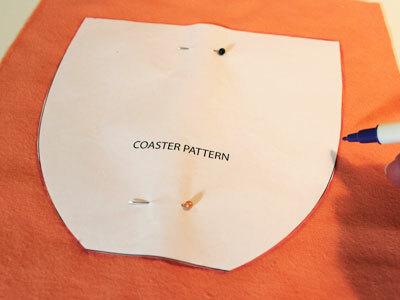 Using an air-erase pen or dressmaker's pencil, mark the center point of the template on the fabric, as well as the vertical and horizontal axis lines. These marks are used to hoop the fabric straight. 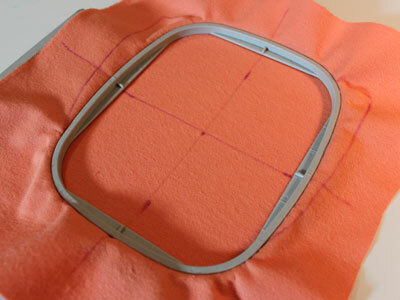 Hoop the fabric with a piece of cutaway stabilizer, lining up the marks on the fabric with the marks on the hoop. 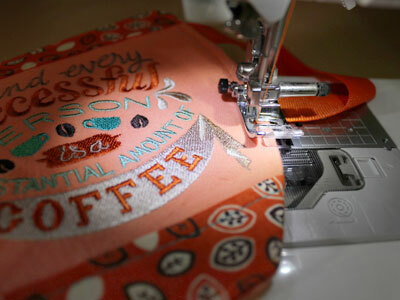 Attach the hoop to the machine and load the embroidery design. Move the hoop so the needle is right over the center point. 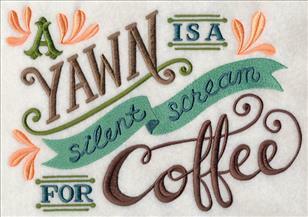 Cut two pieces of the printed quilter's cotton a bit wider than the embroidered piece, and 2" high. 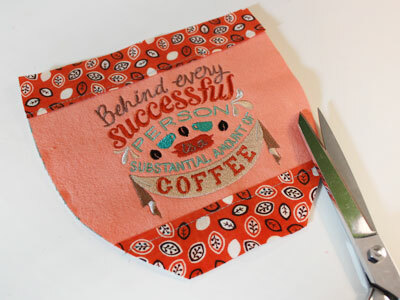 For both pieces, fold one of the long edges over 1/2" and press with an iron. 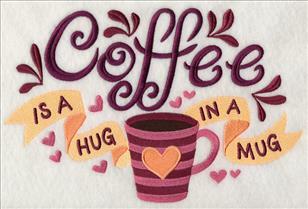 Place the fabric pieces on top of the embroidered piece, right sides facing up. The folded edge should face in towards the embroidery. Leave about 1/4" between the folded edge and the design. 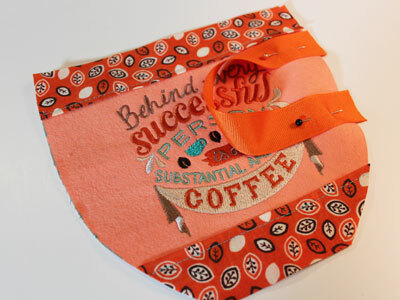 Sew a 1/8" seam along the folded edges of the fabric only. 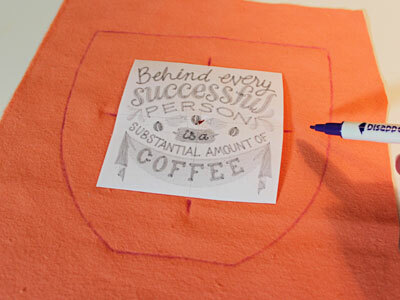 Place the embroidered piece on top of the fabric for the back. Pin in place. Cut out the shape. Unpin the fabric, and set the back fabric piece aside. Cut a piece of ribbon to 8 1/2" long. Place one end of the ribbon under the top trim fabric. Place the other end 1 1/4" below the first end. 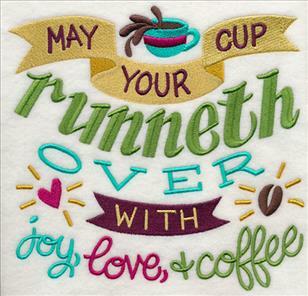 The loop of the ribbon should face in toward the center of the fabric. Pin the ends in place. Leave about 1/4" of the raw ends of the ribbon extending out past the edge of the fabric. 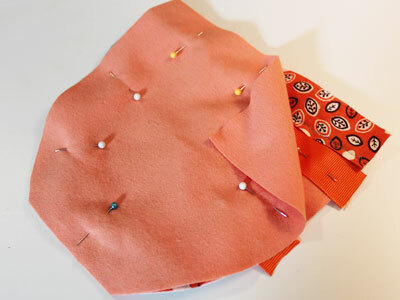 Align the back fabric on top of the assembled front piece, right sides together. Pin in place. 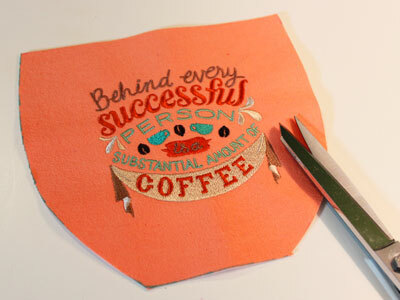 Sew a 1/2" seam around the side and top edges only, leaving the bottom edge open for turning. Trim away about 1/4" of the seam allowance, leaving 1/4" seam allowance remaining. Pin the opening in place. Top stitch a 1/8" seam around the entire outer edges of the shape. 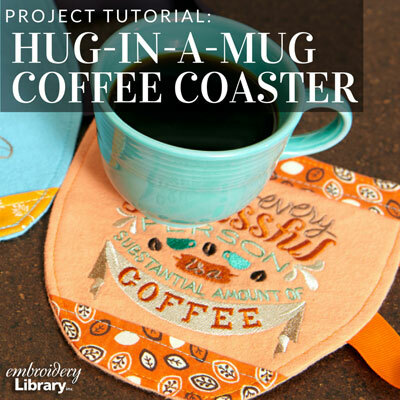 This clever, mug-shaped coaster is the perfect accompaniment to any hot beverage. 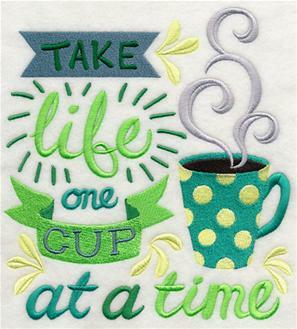 Make one for yourself, and for a friend, too! 7.80" x 7.74" | 6.96" x 6.90" | 5.90" x 5.85" | 4.87" x 4.83" | 3.86" x 3.83"
6.89" x 10.05" | 6.44" x 9.39" | 5.34" x 7.79" | 4.70" x 6.86" | 2.66" x 3.88"
7.80" x 7.48" | 7.20" x 6.90" | 6.11" x 5.86" | 5.05" x 4.84" | 3.85" x 3.70"
10.42" x 6.90" | 8.85" x 5.86" | 7.80" x 5.17" | 6.85" x 4.54" | 3.86" x 2.56"
7.75" x 7.80" | 6.90" x 6.95" | 5.85" x 5.90" | 4.85" x 4.89" | 3.83" x 3.87"
9.75" x 6.90" | 8.28" x 5.86" | 7.80" x 5.52" | 6.86" x 4.85" | 3.86" x 2.74"
7.22" x 7.80" | 6.89" x 7.47" | 5.85" x 6.32" | 4.85" x 5.26" | 3.56" x 3.86"